Rare Presentation of UBC with Management. Department of Orthopaedic, Sancheti Institute for Orthopaedics and Rehabilitation 16, Shivajinagar, Pune, India. Introduction: Simple bone cyst or unicameral bone cyst (UBC) are benign cystic lesions commonly found in femur and humerus. However hand is a very rare site of occurrence. Treatment described for UBC of hand commonly involves curettage and bone grafting. 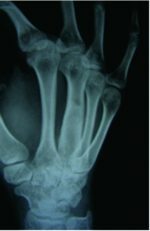 Case Report: A 7 year old right hand dominant girl presented to us with chief complaints of pain and swelling in right 4th metacarpal since 2 month. On imaging, plain radiographs of right hand showed expansile lytic lesion on Metaphyseal-diaphyseal region of 4thmetacarpal with pathological fracture.MRI showed cystic lesions with internal loculations and fluid-fluid levels (Fig 2). There was minimal soft tissue extension. We performed aspiration which showed serosanguinous fluid with haemorrhagic tinge. With the diagnosis of unicameral bone cyst in mind we performed and closed intramedullary nail with k wire. The cyst healed up completely within 2 months. There was no recurrence at 18 month follow up. Conclusion: In conclusion simple bone cyst is very rare in metacarpal bone. However it should be considered as important differential since it warrants simple treatment and extensive procedures should be avoided. Keywords: Simple bone cyst, metacarpal, k wire. Simple bone cyst or unicameral bone cyst (UBC) are benign cystic lesions seen commonly in skeletally immature persons . Males are twice more commonly affected than females . Common sites of occurrence are femur and humerus . UBC are also seen in tibia, calcaneus, cuboid, lumbar spine and pelvis . Hand is a very rare site of occurrence. Very few cases of UBC have been described in hand include metacarpals [3,4]; phalanx [2,5]; hamate  and lunate . Treatment described for UBC of hand commonly involves curettage and bone grafting [2, 3, 4, 5, 6, 7]. We describe UBC of metacarpal in a skeletally immature girl with diagnostic dilemma treated simply with closed k wire insertion. No recurrences seen at 18 month follow up. A 7 year old right hand dominant girl presented to us with chief complaints of pain and swelling in right 4th metacarpal since 2 month. The pain was dull aching and constant with no diurnal variation. Swelling was of insidious onset and gradually progressive. No history of trauma or infection. No other symptoms were present. Her medical, personal and family history was not significant. On examination, it was a solitary, diffuse and bony hard swelling over 4th metacarpal of right hand which was tender on palpation and no local rise in temperature. The range of movement at 4th metacarpo-phalangeal joint was terminally restricted due to pain in all directions. No other swelling present in other parts of the body. There was no sensory–motor deficit and distal circulation was normal. Patient was earlier seen by various orthopaedic surgeons who investigated the lesion and advised excision of cyst with bone grafting. On imaging, plain radiographs of right hand showed expansile lytic lesion on Metaphyseal-diaphyseal region of 4thmetacarpal with pathological fracture. MRI showed cystic lesions with internal loculations and fluid-fluid levels (Fig 2). There was minimal soft tissue extension. Routine laboratory investigations, coagulation profile and metabolic profile were normal. Serum alkaline phosphatase was slightly raised. We repeated the plain radiograph which showed expansile lesion with pathologic fracture on 4thmetacarpal (Fig 1). With these investigations available we performed a biopsy which showed serosanguinous fluid with haemorrhagic tinge. With the diagnosis of unicameral bone cyst in mind we performed and closed intramedullary nail with k wire (Fig 3A). The cyst showed signs of healing within a month (Fig 3B) and k wire was removed. The cyst healed up completely within 2 months (Fig 3C). There is no recurrence at 18 month follow up and range of motion is full at metacarpo-phalangeal joint. The differential diagnosis of lytic cystic lesion in hand in a skeletally immature patient include unicameral bone cyst, aneurysmal bone cyst, osteoblastoma,giant cell reparative granuloma, enchondroma and intraosseous ganglion cyst . Intraosseous ganglion cyst is a benign lesion commonly seen in carpus and presents as expansile lesion. Histologically it contents myxoid material . Enchondromas are cartilage forming lesions and are most common benign lesion in hand. They presents as well circumscribed lytic lesion in metadiaphysis. Histologically presents with presence of cartilage cells . Giant cell reparative granuloma is reactive benign lesion classically seen in skull and facial bones and also in small tubular bones of hands and feet. Histologically these presents with fibroblasts, multinucleated giant cells and areas of haemorrhage . Osteoblastoma are benign bone forming lesion commonly found in spine and rarely in hand. On radiograph they present as area of lucency with surrounding sclerosis .On histopathology they show presence of osteoblasts. Osteoblastoma, enchondroma, intraosseous ganglion cyst and giant cell reparative granuloma were excluded in our case based on typical histopathology findings. Aneurysmal bone cyst (ABC) presents as eccentric expansile lesion with blood filled cavities. 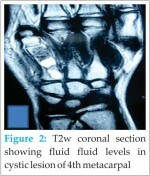 On MRI it shows fluid-fluid levels, however this finding is not specific for it . UBC are centric expansile lesion in the metaphysio-diahyseal location. Radiograph may show classic “fallen leaf sign” representing a piece of bone due to pathologic fracture . The characteristic fluid-fluid level seen in ABC is due to sedimentation of erythrocytes within serosanguinous fluid  This finding is observed only in 60% of cortical ABC . The other lesions showing fluid-fluid levels are chondroblastoma, telangiectatic osteosarcoma, fibrous dysplasia, unicameral bone cyst, giant cell tumour, intraosseous ganglion cyst, plasmacytoma and osteomyelitis. Thus in our case the lesion can still be either UBC or ABC. To further reach the diagnosis we performed aspiration of the lesion. The aspirate was serosanguinous with hemorrhagic tinge. The hemorrhagic tinge can be due to associated pathological fracture. Thus with all above finding radiograph, MRI and aspiration taken together an informed diagnosis of UBC was made in our case of centric expansile lesion with fluid fluid level and serosanguinous aspirate. Treatment options for UBC include observation, curettage and bone grafting, intralesional steroid injection  and recently intramedullary nailing . Baruch et al performed curettage and bone grafting for two cases of metacarpal UBC .Recurrence of cyst remains the main complication regardless of treatment option . Various theories have been proposed in pathogenesis of UBC like dysplasia within the cyst due to trauma, intraosseous synovial cyst and more recently venous occlusion leading to increased intramedullary pressures . Thus leading to conclusion that re-establishing these vascular channels may lead to healing of cyst. Use of titanium elastic nails to open the connection between the medullary canal and cyst and break the septae within the cyst have been well documented in treatment of long bones UBC. Hence we used a k wire to break the septae and provide intramedullary support. The cyst showed signs of healing within a month and was completely healed in 3 months with no recurrence till date. Simple bone cyst is very rare in metacarpal bone. However it should be considered as important differential since it warrants simple treatment and extensive procedures should be avoided. 1. Wilkins RM. Unicameral bone cysts. J Am Acad Orthop Surg.2000;8:217–224. 2) Diaz VA, Vernon SE, Ouellette EA. 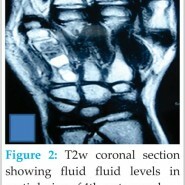 Pain and deformity of the index finger in a 41-year-old woman. Clin Orthop Relat Res. 2009 May;467(5):1387-91. 3) Head SA. Unicameral bone cyst located in metacarpal bone:report of a case. J Am Osteopath Assoc. 1984;84:372–373. 4) Baruch A, Haas A, Lifschitz-Mercer B, Zeligowsky A. Simple bone cyst of the metacarpal. J Hand Surg Am. 1987 Nov;12(6):1103-6. 5) Ewald FC. Bone cyst in a phalanx of a two-and-a-half-year-old child: case report and discussion. J Bone Joint Surg Am.1972;54:399–401. 6) Jasan M, House JH, Brand JC. Bilateral unicameral bone cysts in the hamate bones. J Hand Surg Am. 1990;15:888–890. 7) Unicameral bone cyst of the lunate in an adult: case report J Orthop Surg Res. 2010; 5: 79. 8) Tham S, Ireland DC. Intraosseous ganglion cyst of the lunate:diagnosis and management. J Hand Surg Br. 1992;17:429–432. 9) Weiner SD. Enchondroma and chondrosarcoma of bone: clinical, radiologic, and histologic differentiation. Instr Course Lect.2004;53:645–649. 10) Ratner V, Dorfman HD. Giant-cell reparative granuloma of the hand and foot bones. Clin Orthop Relat Res. 1990;260:251–258. 11) Adler CP. Multifocal osteoblastoma of the hand. Skeletal Radiol.2000;29:601–604. 12) Mahnken AH, Nolte-Ernsting CC, Wildberger JE, Heussen N, Adam G, Wirtz DC, Piroth W, Bu¨cker A, Biesterfeld S, Haage P, Gu¨nther RW. Aneurysmal bone cyst: value of MR imaging and conventional radiography. Eur Radiol. 2003;13:1118–1124. 13) Reynolds J. The ‘‘fallen fragment sign’’ in the diagnosis of unicameral bone cysts. Radiology. 1969;92:949–953 passim. 14) McVey MJ, Kettner NW. 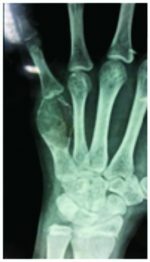 Pathologic fracture of metacarpal enchondroma: casestudy and differential diagnosis. J Manipulative PhysiolTher. 2002Jun;25(5):340-4. 15) Shimal A,Wee B, Nicklaus-Wollenteit, Sumathi V, Davies AM,James SLJ. Subperiosteal aneurysmal bone cyst of the metacarpal. European Journal of Radiology.2009Sept;71(3):117-119. 16) Roposch A, Saraph V, Linhart WE. Flexible intramedullary nailing for the treatment of unicameral bone cysts in long bones. J Bone Joint Surg Am. 2000 Oct;82-A(10):1447-53.